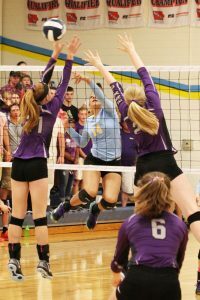 The Lynnville-Sully varsity volleyball team split last week for a win and a loss. Their win came in a nail biter against Baxter on Tuesday, Aug. 29, after a full five sets. The Hawks’ loss came later in the week against the Class 3A East Marshall Mustangs in four sets. Clockwise from left, Camryn Russell, McKinley Conover, Makayla Rozendaal, Skyler Young, Carson Fisk, and Shiloh Cunningham are all smiles while having a successful night against Baxter on Tuesday. The Hawks got off to an eager start versus Baxter, winning the first two sets, 25-21 and 25-20. They were unable to win the third set, 25-19, and couldn’t finish out the fourth set, 25-20, sending them into the fifth and final set. They were able to pull off the final game, 15-13, for a successful night. The Hawks had an impressive 43 kills, 17 of those coming from sophomore Mallory Loftus. L-S also served a solid 26 aces with seniors Skyler Young and Camryn Russell serving a successful 24 serves out of 24. On the defensive end, Russell totaled seven blocks, four of those being solo blocks. Junior Shiloh Cunningham had six blocks and Loftus had five. Junior Makayla Rozendaal led the team with eight digs on the night. The JVA team beat Baxter, 2-0: 21-9 and 23-21. The JVB team went into three games but came up with the win, 2-1: 18-21, 21-12, and 15-11. Junior Shiloh Cunningham gets a hit past a Baxter block in last Tuesday’s game. The Hawks won in five sets. Thursday played out quite differently for the Hawks. The beginning was a little bumpy as they lost the first set 25-18 and the second one 25-16. They were able to battle back in the third set to get the win, 25-22. But L-S dropped the fourth game, 25-21, to finish the night against the bigger school. L-S had 13 missed serves but also served up 13 aces. Cunningham led the team with 11 kills. M. Loftus and freshman Korinne Jansen both had six kills. Sophomore Janelle Rozendaal assisted 15 times. Cunningham, Loftus, and Russell all had four blocks. Senior McKinley Conover had nine digs followed by Russell’s eight digs. The L-S JVA team was victorious over East Marshall, 2-0: 21-17 and 21-8. The JVB team also had a successful night, going 2-0: 21-13 and 21-14. Sophomore Mallory Loftus puts down one of her 17 kills against Baxter on Tuesday.